Introducing your children to yoga at an early age can help them learn healthy lifestyle habits and set the foundation for a fit future. 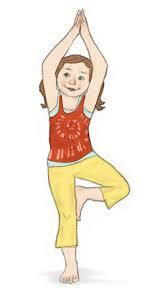 Get your family practice started with these kid-friendly yoga poses. Teach your child that moving a muscle can help change the way they're feeling. It’s hard to find solutions when everything feels tight! 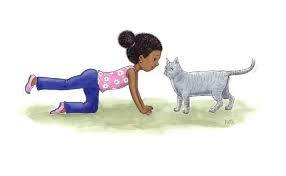 Let your child know that when they feel frustration, stress, or anger, that it can be helpful to try Cat Pose. Inhale and look up, letting your spine drop low. Exhale and tuck your chin, lifting your spine up high like a cat. You can count to 10 when you bake a Yoga Pizza (Seated Forward Bend with legs apart), when you drive under a yoga tunnel (Bridge Pose) with your imaginary Yoga Car (Seated Forward Bend), or count down to launching a Yoga Spaceship (Chair Pose with hands raised)…or you can even count really, really slowly when you are in a Yoga Tortoise. This pose improves your sense of balance, strengthens your legs and back. Place your right foot on your left thigh and keep your left leg straight while maintaining balance. While inhaling lift your arms over your head and bring both palms together. Keep your spine erect and take few deep breaths before you exhale slowly. This pose stretches the legs and the torso and makes you breathe deep, encouraging more controlled breathing. Stand with your legs wide apart keep the left leg straight and stretch out your right leg at a 90-degree angle. Keep standing in that position and make each arm touch the ground, one at a time and keep inhaling and exhaling. 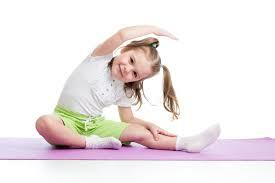 Stretch as much as you can and ensure the body is bent sideways and not forward or backwards.